It was a grand day out for CCR on Saturday 20th October 2012 as they took the CCR fun bus up to play Leeds Roller Dolls at the last bout in their Huddersfield venue. First up, CCR’s Slays, in their second game of the season, took on the LRD Whip Its. Leeds were strong off the mark, gaining lead in the first six jams. The Whip Its, had solid walls and delivered big hits, clocked up 19 points with no answer from the Slays, despite tenacious play from the visitors. The Slays scored at the end of the first half, and half time the score was 64-8 to the Whip Its. The second half saw the Slays come back stronger, gaining lead in some jams, and showing some excellent defensive work by CCR blockers, but despite a valiant fight from the Slays, the Whip Its took the game with 145-49. 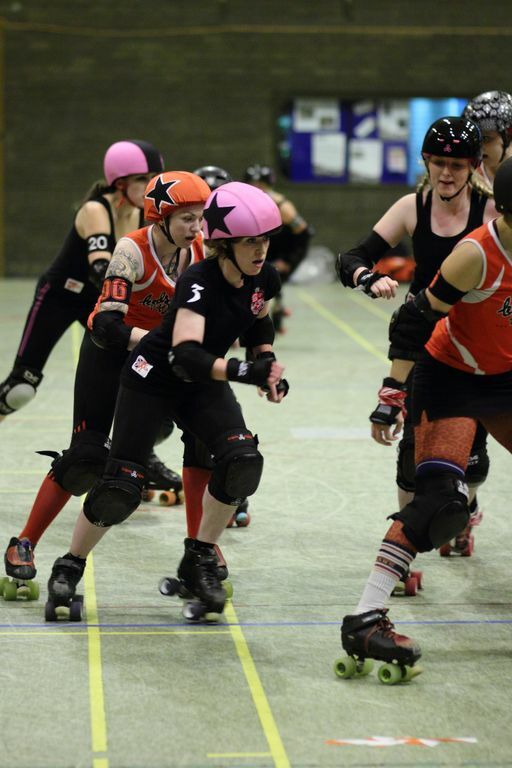 CCR’s Centrinnians went into their bout having won both their match ups against Leeds Rebel Roses in previous years, and the game was eagerly anticipated in the run up to next months European Championships – a tournament which features both travel teams. Like wheeled Dr Sam Beckett’s – with added eyeliner – the Cents took to the floor in the second bout of the day, to put right what once went wrong. When the first whistle blew it was LRD’s jammer who quickly got out the pack and was the first to get points on the board. CCR’s jammer was not far behind and a quick call off saw a 3-0 start for LRD. In the following jam LRD’s jammer was quickly out of the pack again but picked up a major penalty along her way. CCR received a power play and took the lead at LRD 3 – 17 CCR. Several jams followed which saw power plays to the advantage of both teams in a cacophony of whistles. LRD were effective at recycling to the back and chasing down at the front, to minimise power play damage, but this was often at the expense of penalties, and their busy penalty box enabled CCR to extend their lead further. After 30 minutes of play the scores stood at LRD 44 – 121 CCR. In the second half, CCR remained focused and the game played out in a similar pattern to the first half. At times LRD looked like making a scoring run, with well timed offense and nippy jammers, but CCR’s packs stayed strong. Even when down on numbers at times CCR blockers hit hard, while their jammers fought through walls during power plays to increase their score. This was made easier by an often-full LRD penalty box. The travel team game was fast and hard- hitting game, and CCR returned to Birmingham with the win, final scores LRD 113 – 231 CCR. 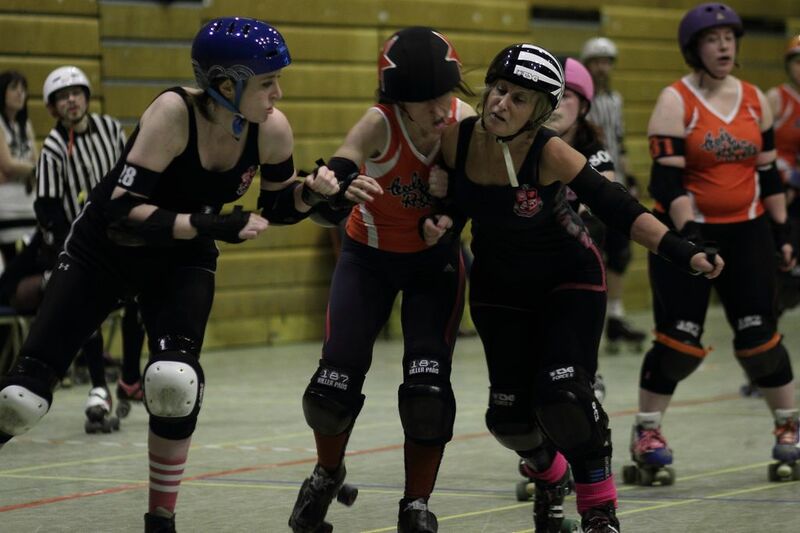 Both teams now return to training in preparation for next month’s WFTDA Track Queens tournament in Berlin, along with 8 other of the top teams in Europe.